The Price of Democracy From Seed Patents to the TPP. Special Offer: FREE King Harry Seed Potatoes. A Story of Potatoes: Pomme de Terre in France. 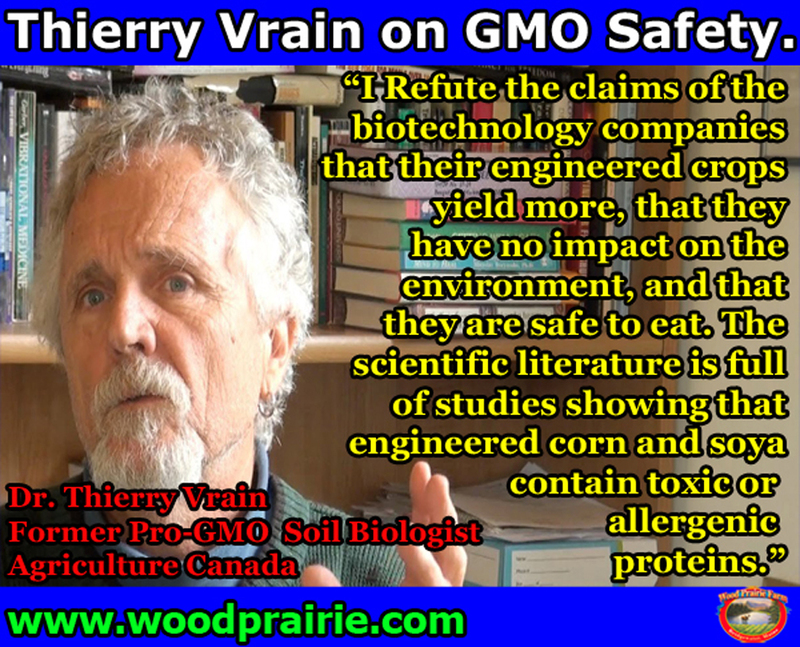 Notable Quotes: Thierry Vrain on GMO Safety. Recipe: Delicious Versatile Tomato Sauce. Change on the way. Time to start thinking about seed. A few sunny days recently that worked their way up to the 20s remind us of warmer days to come, today’s -22ºF not withstanding. Much of the East has had a wild winter. February set records across Maine as being the coldest February ever recorded. Now that it’s warming up we’re back to being busy shipping orders – some of which have been delayed for weeks because of cold weather here in Maine or along the delivery route. Next week's forecast appears warmer nationwide. Wherever you are, we hope you’re close to experiencing Spring. 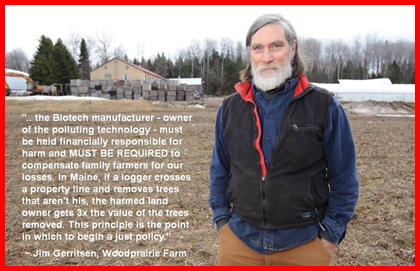 Jim Gerritsen on Wood Prairie Farm. Last year end of April. Note snowbanks by high tunnel and pallet boxes. This week Jim was interviewed by Food Integrity Now host Carol Grieve’. The bare knuckle interview (49:15) covered a wide variety of hot topics. 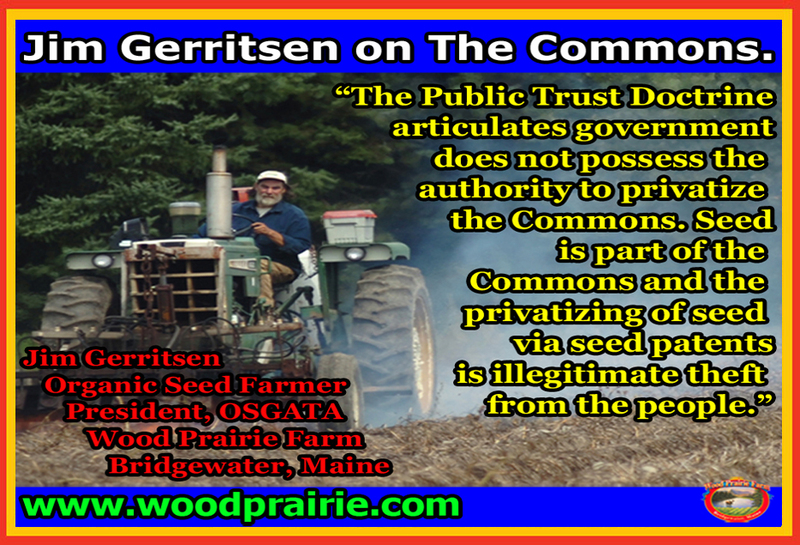 Subjects ranged from the Public Trust Doctrine, to the protection of the Commons in general and Organic Seed in particular, to the landmark OSGATA et al v. Monsanto federal lawsuit. This wasn’t the first time Jim has been interviewed by Carol. Carol is a talented host and always does her homework before an interview. 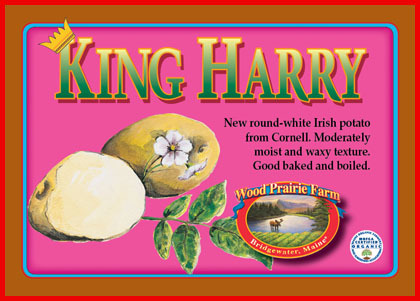 If you have trouble with insect pests on potatoes you should give King Harry a try. King Harry was traditionally bred (NO Genetic Engineering involved!) by potato breeders at Cornell university in New York by crossing wild relatives of potatoes. Researchers developed a good tasting potato with considerably fewer problems from insects. Pest: Colorado Potato Beetle, Potato Leafhopper and Flea Beetles. Here’s your chance to give King Harry a try. Get a FREE 1lb. 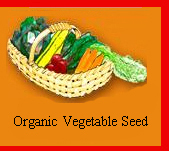 sack of King Harry Organic Certified Seed Potatoes (value $11.95) on your next order where the goods total $35 or more. Offer Expires Midnight, Monday March 9th. Use code WPF451. Offer cannot be combined with other offers. King Harry. 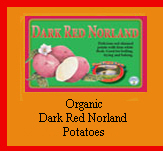 Naturally resistant to a potato's three major insect pests. Vegetables in France. Warm thoughts for a Winter day..
About this time of year in Maine, when the snow is at it’s deepest and cabin fever set in weeks ago, it’s nice to entertain thoughts about Spring. What better place to consider Spring than the French countryside. 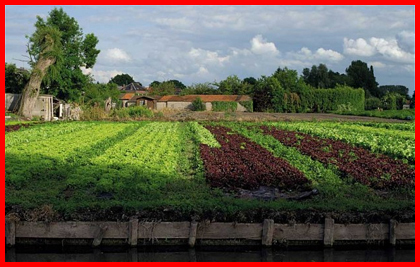 You are sure to enjoy this interesting article about French vegetables. Included is mention of the variety Charlotte, which our friend Eliot Coleman raves about and has grown for many years. Drain the tomatoes, reserving 1 cup of the juice. Crush tomatoes with back of a spoon, and set aside. Heat the oil in a saucepan over med-low heat. Add the onions, carrot, and garlic. Cook, stirring, until the onions and garlic have wilted, about 10 mins. Add the tomatoes, reserved juice, tomato paste, and remaining ingredients. Cover, and cook over medium heat for 15 minutes. Remove the cover and simmer another 45 minutes, stirring occasionally. 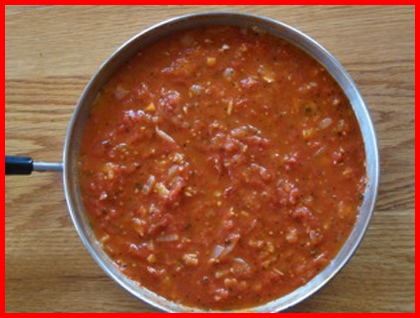 Delicious and Versatile Tomato Sauce. Our Mailbox: Freedom From Conflict. Freedom from financial conflict might even be impossible. 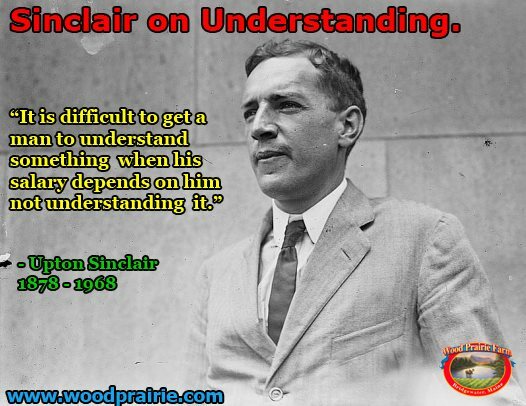 I think this dilemma points to the tangled web of conflicted interests rampant in our politics today. For example, the GMA fights right-to-know GMO labeling by illegally laundering money from Big Ag and Big Food to buy electoral results. The GMA and their corrupt financiers are oozing with conflict of interest. Have they not lost their moral right to participate in these policy issues?